I've said it before and I'll share it again: Skaneateles is my favorite town in all of Upstate New York. It has a different feel, for me, even from other chi-chi enclaves like Saratoga, and that quality has everything to do with the body of water for which the village is named. That dazzling, serpentine slash of bright turquoise is unique in all of the Finger Lakes, and a major boon to the experience that is Skan. So when Big Hungry Melinda suggested we spend a recent Saturday in the picturesque village, I jumped for joy. We did a little light shopping, some sight seeing, and lunch at an old favorite of mine, The Bluewater Grill, which is right on the main street of the village and of course, right on the lake. If you've been reading the blog all summer, you're probably surprised that I didn't order the lobster and crab salad sandwich. I was somewhat turned off by the word "salad," in the description, I'm not going to lie. It conjured up a more mayonnaisey affair than I was game for - what's wrong with a classic lobster roll? And why aren't there more of them on summer menus this side of the Hudson? But I was feeling lobstery, obviously (when am I not? ), so I doubled down for the lobster bisque and the lobster napolean. The soup is rich and thick, but tasted more of cream and sherry than lobster. 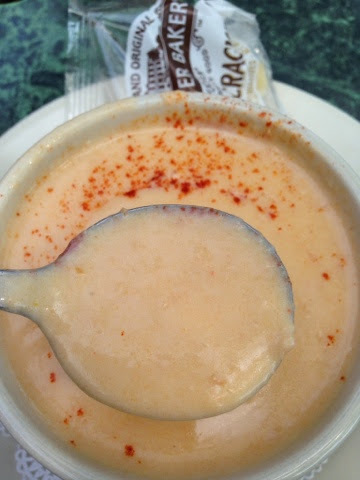 For $5, I wasn't expecting the most amazing bisque ever, but a few more generous chunks of the sweet shellfish would have been welcome, and I would recommend the base of this soup be started from scratch, as they say. Is there a lobster shortage in New York of which I'm unaware? I don't know about that, but I do know there was a shortage in my soup. I was more pleased with the napolean, which was indeed endowed with more mayonnaise than I would prefer, but was also lighter than a lobster roll and a really nice dish for a sunny day by the lake. I liked the avocado, mango, and crisp, thin slices of cucumber, but the tomato and onion kind of fought with the better flavors of the dish, for me. 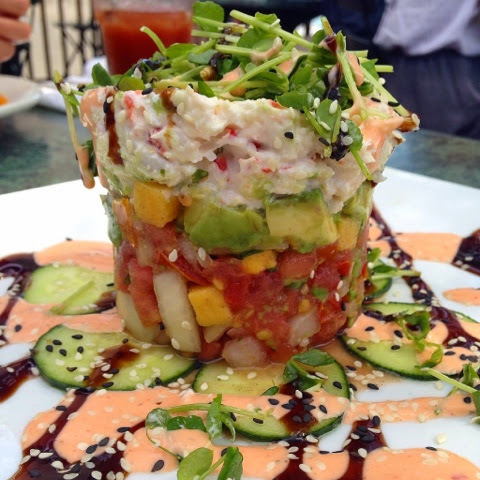 The avocado was so creamy, the mango so sweet, but the tomato dissipated that great flavor and lessened its impact. Again, I felt like the chef was working harder on keeping the price down than he was on the flavor integrity of the dish. The Thai chili mayo and balsamic syrup on the plate were really nice, and I wished some of that heat and intensity had been in the lobster mixture itself, which again, was not huge on lobster flavor. I think some very minor tinkering and maybe $3 more to this $16 appetizer would make it an A+, and I have a hard time believing The Bluewater couldn't command that price in one of the posher locations in Central New York. 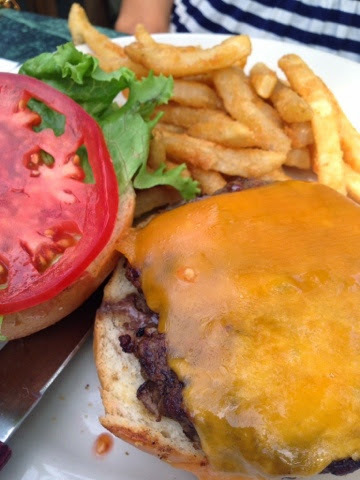 Melinda was feeling a hearty burger, and went all in on the black angus cheeseburger and fries. You guys, I want to tell you it was amazing, but alas, it was pretty ordinary. Slightly thicker than a fast food burger, yellow cheese (one slice), lettuce and tomato. I know they have a couple more inventive options, and maybe it would have been more interesting if she'd gone for one of those, but shouldn't every item on the menu be treated with care? The Bluewater Grill in my memory was a special place with upscale but still relatable food, but on this visit, it felt touristy and run of the mill. Even my Bloody Mary was kind of watery and uninspired. Granted, it was packed, and I know the pressure of cranking out food on a weekend when you're the closest restaurant to the main attraction (ie, Skaneateles Lake), can become a recipe for dumbed down food and compromised kitchen standards. I hope that's not the story here for the long haul. A great view should not be asked to compensate for mediocre food, especially not in idyllic Skan. Luckily, we made a wise choice for dessert, and after shopping and strolIng, made our way to Patisserie, behind The Sherwood Inn. 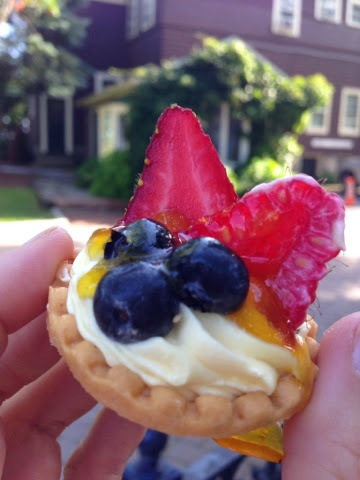 And just as when I visited Paris in high school, I was all too susceptible to the charms of the shiny, jewel-like fruit tartlet. But this time, it was so, so worth it. Bright fruit, bursting with the flavors of summer, and creamy, not-too-sweet vanilla pastry cream in a light, crumbly crust. The perfect bite. Patisserie is a tiny bakery with cupcakes (natch), pastries, breads and granola. It's a million degrees inside, so get in, get sugared up, and get out. People were strolling all over town gnawing on small baguettes with Patisserie bags dangling cooling from their fingers, lending the whole village a very Euro vibe. There are still a couple good weather weekends left, so hie thee to Skaneateles, grab yourself some divine baked goods and try the new Gilda's - which is on the wrong side of the street if you want to water gaze, but looked to be more promising, lunch-wise, than the gamble we took. But do select a Saturday and put Skaneateles on your list. There are few to no chains in the village, so your money will stay local, and you can browse for art, gifts, women's clothing, children's toys, pet stuff, furs, kitchen gear, and stationery, all within a three block walk. And when your wallet needs a rest, grab your baguette and a bench on the waterfront and enjoy that view. It's not just a long lake - it's light blue, sun speckled, and pretty dang breathtaking. Let me know what you think! My personality is big; my hunger is bigger! I am a jumbo lump crabmeat lover. Agree on more meat, less mayo! Beautiful views and food reviews! Always enjoy reading about your adventures ! That burger looks really sad. Soup looks like it didn't start from stock for some reason. The napoleon looks perfect as does the dessert at Patisserie!